Home » Govenor Rauner » Bill wants Illinois to go all-in on green energy by Sun-Times. A bill seeking to move Illinois to 100 percent renewable energy by 2050 was introduced in Springfield on Thursday. Renewable energy only accounts for about 4 percent of electricity in Illinois, according to a spokesman for the the Illinois Clean Jobs Coalition, the nonprofit group that drafted the legislation. Nuclear, coal and natural gas — in that order — are the main sources of the state’s energy. “These goals are ambitious but they are achievable,” said Cristina Castro, D-Elgin, one of 10 state senators who co-sponsored the Clean Energy Jobs Act. There are 35 co-sponsors in the Illinois House. States can’t wait for the federal government to lead the way on protecting the environment, Castro said. The proposal expands on the Future Energy Jobs Act, which was passed in 2016 and requires that renewable energy account for 25 percent of the state’s electric supply by 2025. 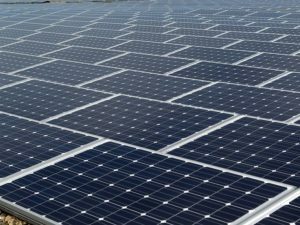 The 365-page bill would create a network of about a dozen training centers aimed at creating a workforce pipeline in low-income communities and communities of color for the state’s emerging renewable energy sector. The bill calls for a carbon-free power sector in Illinois by 2030 and contains incentives for renewable energy companies to invest in communities once anchored by coal plants. Another key component of the legislation: it seeks to steer local governments away from using diesel fuel to power public transit and fleet vehicles by providing incentives to build the charging infrastructure necessary to support electric vehicles. The 2016 bill spurred growth in the solar market that — when it comes online over the next two years — is predicted to double the state’s use of renewable energy, said Andrew Barbeau, a spokesman for the Clean Jobs Coalition. Barbeau said the proposal would create thousands of new jobs by 2030 and $30 billion in private investment. “As the state’s largest producer of carbon-free energy, including nuclear plants that produce 90 percent of Illinois’ zero-carbon energy, we are committed to working with policymakers, the Clean Jobs Coalition, and other stakeholders on clean energy solutions for Illinois,” Fein said.